Twenty seven year old Andrew Muse is living a life full of adventure and excitement. A life many would love to have just a taste of. 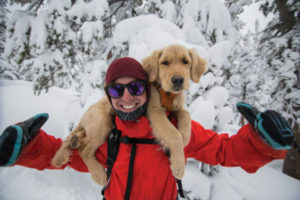 Traveling the country with his Golden Retriever, canine companion, Kicker, Muse is seen with a genuine smile with each new-found, adrenaline-charged quest, and Kicker is right alongside him in almost every video or photo posted to Instagram @Andrew__Muse. Muse is famous…Instagram famous. With 30.2 thousand followers, Muse and Kicker always have a great photo, or video to share with their adoring fans. Traveling around in their 4 x 4 adventure van, jumping out from time to time to go snowboarding, kiteboarding, rock climbing, or hiking, these two constant companions are anything but boring. Their adventures will soon be released by GoPro with Season two of Tiny Home Adventure, which is set to be release by Fall 2016. But wait! This story doesn’t start here. Yes, it’s still in the beginning stages, after all Muse is just 27 and has a lifetime of adventures waiting for him, but this is more like Chapter 2, or maybe even Chapter 3. Chapter 1 was spent growing up in Massachusetts with his mom and sister where Muse would spend hours in the woods building forts and exploring. “Every two weeks I’d release an edit,” said Muse. “I did all the editing and all the filming.” I’m sure Booter helped keep him on track and entertained while Muse worked away on his computer. When Muse was not remodeling his camper, he was finding ways to boost the adrenaline that coursed through his veins. Rappelling off of a bridge, long boarding for miles, snowboarding, and white water rafting were just a few of the activities that kept his body in a naturally induced state of euphoria. Of course Booter fed off of Muse’s excitement and was a willing participant in almost every activity. to get a feel of what a typical day in the life of @Andrew__Muse is all about. Like the old 60’s song, Andrew Muse was ‘born to be wild’ with his dog Booter at his side of course. And focus on it he has. Season one of Tiny Home Adventure can be seen on YouTube as well as Vimeo. Amazing footage is captured by Muse. You won’t be disappointed if you check it out. Of course with every great story comes great tragedy. After filming the final episode of Tiny Home Adventure, Muse and Booter headed toward home. Two hours before reaching their destination, at 60 mph, Muse slams into the back of a semi that was going just 40 mph. His truck and tiny home were destroyed. Everything he owned lay scattered along I-15 in Utah. Digging through the rubble he found Booter, he was severely injured and died in Andrew’s arms. Life at that moment and for the days and weeks to follow felt like it was beyond repair for Muse. 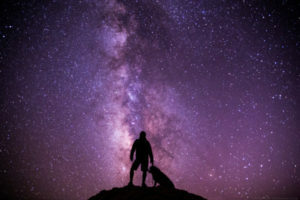 His best friend, his constant companion, was gone. His career, which relied heavily on the comradery of the two together, seemed to be over. Chapter 3. Life is beginning to feel more like an adventure again. Muse is back in the thick of adventure seeking. Recently Muse participated in the Kiteboarding4Cancer event in Hood River. One project he took on was to paint a kiteboard that would later be auctioned off to raise money for the event. Once again life dealt Muse a blow. The Kiteboarding 4 Cancer event raised $194,000 in a single weekend. “It’s insane how much money they were able to raise and how many good people they bring together,” he said. So what does the rest of the book of @Andrew__Muse look like? Only time will tell, but so far things are looking pretty good. Once Muse arrived home after his car accident he was trying to figure out what he was going to do with his life. 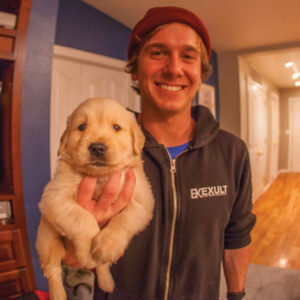 He had gotten a job offer to be the video coordinator for the US Ski Team, but he had planned on coming home and figuring out how to make season two of Tiny Home Adventure sustainable if possible. He was totally broke, his equipment was gone and he’d lost his business partner. It was beginning to look like he would have to take the position with the US Ski Team simply because it seemed like his only option. Life had other things in mind for Andrew. To top that off another dream came true after opening an email from GoPro. “GoPro reached out to me and asked if they could pick up season two,” said Muse. They wanted to know how much Muse would charge. “So I gave them a number that was close to what I would be making with the US Ski Team and they accepted it. Is was a pretty crazy email to have GoPro hit you up and say, ‘hey, there are so many opportunities for us to work together our head is spinning’…I was like, ‘is this real?’”. Muse has sent more than 50 hours of footage to GoPro and season two of Tiny Home Adventure should be available online by this fall. Of course Kicker will be right by his side. “My goals for the future are to continue this lifestyle of doing what I love and inspiring people to do the same. That’s kind of my big thing. I really like to inspire people and tell them you can do what you love, and make a career out of it if you are really willing to work hard enough and make sacrifices, like superficial sacrifices. I feel that for an exceptional life you have to be willing to go down a road that most people haven’t gone down and take the risk to get there. I think inevitable you can be successful if you are willing to work hard enough and be willing to put enough of positive energy into it,” said Muse.